Mike McClelland is a firm believer that shade lines around hard cover like trees and docks can be productive even in cold-water scenarios. Mike McClelland has always marched to the beat of his own drum. Bucking the norm is nothing new to him, so when anglers learn that he targets the shade in cold water instead of the sun, it might raise an eyebrow or two. �So many guys will pull up to a boat dock in the spring and disregard the shade and just fish the cover of the dock,� McClelland said. �Through my years of fishing, I realized so many of my bites have come from the shade line instead of the dock itself." 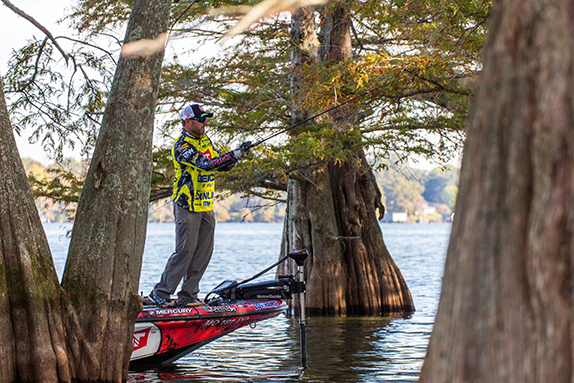 Regardless of what part of the country he�s fishing during the cold-water months, McClelland will seek out the shade. �A shade line gives bass that sense of security and cover,� he said, �but they want to be close to the sun which is creating the shade because of the cold water and the temps they are fighting this time of the year." Bass still have predatory instincts in wanting some sort of cover, McClelland added, but they don�t want to bury up into shade by hiding under a dock, preventing them from using the �soft shade lines� as ambush points. Fish will utilize the shade thrown over a point by a big tree the same way. They�ll cruise the edges, always keeping their body in the sunshine to feel the warmth of the sun and their nose and eyes into the shade to make them feel like they are hidden, yet always ready to ambush, McClelland says. When dealing with larger areas of shade created by a larger set of docks or a larger dock that may harbor a number of fish, the bigger fish tuck a little further into the shade, ducking just out of sight. Most often, the smaller fish are the first to commit while the larger fish are less aggressive when covered by shade. The SPRO RK Crawler is a good tool for targeting bass hovering lower in the water column around shade lines. When dealing with isolated fish, McClelland knows their behavior well. Big bass typically occupy the high-percentage areas like the very corner of the shade lines where two lines intersect. Those spots hold more potential than a shade line that runs parallel to a dock. Early in the morning, baitfish tend to be out deeper, but as the sun rises they�ll move shallower and the bass will follow. Bass will initially set up on a shade line and wait for the bait to arrive. McClelland has studied this behavior repeatedly using Garmin Panoptix. Knowing that bass will be lethargic, he tries to keep his bait in the upper portion of the water column when targeting shade lines. Pinpoint placement of a jerkbait is a great option for this pursuit and McClelland relies on the SPRO McStick 95 and 110 versions in these situations. He�ll pair a 6-foot, 8-inch medium-heavy Falcon Cara ST casting rod with a low gear-ratio reel, which forces him to fish slow. Some fish tend to hunker on the bottom once they move shallow. McClelland favors a 1/2-ounce ball-head or Dirty Jigs Tour Level Skirted Football Jig paired with a Big Bite Baits Chunk or a small crawfish trailer. �Those fish will pull up real shallow, but they�ll still use those shade lines,� McClelland said. A 3 1/2- to 6 1/2-inch Big Bite Baits Suicide Shad or a Cabela's McClelland Competition Series 3.4 Swimmer fished on an under-spin or a ball-head jig is great when imitating bait. He�ll fish it through the water column wherever the bass are holding. He�ll mix in a SPRO RkCrawler 55 crankbait when targeting bass in the 9- to 14-foot range. 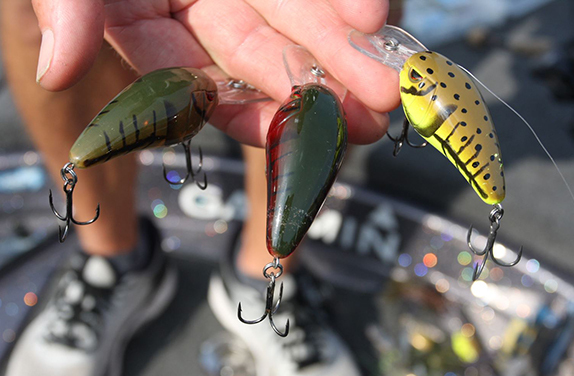 McClelland uses the ClearV� and Panoptix features of his Garmin units to locate bait in the water column. He�ll make sure his bait is just above them and if they�re on the bottom, right in front of them. The role of good mapping and electronics is key. 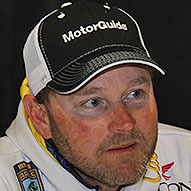 Jimmy Houston - "I like his moral beliefs and his spinnerbait techniques. I've always been a diehard spinnerbait fisherman." Beaver Lake (AR) - "It's a great place to learn versatility, but it's probably hindered my learnnig about grass fishing." Lake Champlain (NY/VT) - "It's such an incredible smallmouth and largemouth fishery. There's not many places you can go to that are like that." Florida lakes - "I feel like I'm fishing in a big farm pond there. It seems like there's no defined patterns or transitions. You're just pretty much fishing a big, grass-infested farm pond." Father - "He's always supported my dream, and he's very optimistic about achieving your dreams." "I like to archery-hunt for deer, but I enjoy any type of hunting. I also like to be an assistant coach for my boy's teams, and fish with my wife." "It's always been a lifelong love. I was introduced to it at a young age. I also think it's the competitive nature of it. I wasn't big enough for the other sports, but this is soemthing I felt like I could compete at and be one of the best at."